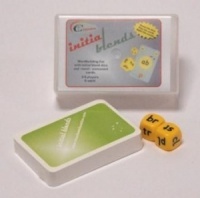 Can be used as a Card and Dice Game or as Flashcards. A unique card+dice game for reading and spelling with final consonant clusters, and for use as consonant sound flashcards. A lot of children can handle blends at the beginning of the word, but come unstuck when it comes to spelling them at the end. This can sometimes be as a result of auditory discrimination problems, although this is not always the case. Final Blends is an excellent resource for enabling your students to keep practising a range of these final sounds until spelling them is no longer a problem- and to have fun while they are doing so! Sounds covered: nd, ng, nk, nt, nch, tch, ld, lk, mp, ft, st, sk. Various playing options allow for very competitive, quick-thinking play, or straightforward turn-taking rules that give no player any advantage over the other(s). 2-6 players can play. FLASHCARD USE: A number of children are confused by the "schwa" sound made when sounding out single consonants in the traditional way, and need to attach a vowel sound to the consonant. 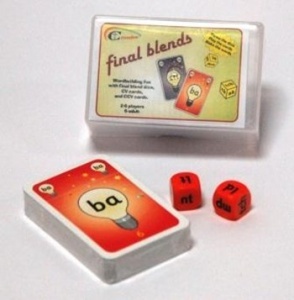 FINAL BLENDS cards are ideal for this purpose. Card size: 85mm x 55mm. (Standard playing card size).